They are also still seeking more tips, via the Homicide Unit office at 206-684-5550, or their tip line at 206-233-5000. 17 Replies to "VIDEO: Seattle Police report breakthrough in last year's Luna/Anchor Park-area murder"
Was there a resolution to the incident of the woman off Emma Schmitz Park a few years back now? I’m curious about the surveillance camera footage shown in the above SPD video. Was any of the footage taken from surveillance cameras installed by the Port some years back? Do I recall correctly those cameras had been either deactivated or removed? The 2013 cameras were removed a year ago. Nearest one was around the bend a bit. Most of the footage in the SPD video is from their officers’ bodyworn cameras. By “surveillance video” I believe they are referring to private cameras. The image of the security camera really caught my attention too. Seemed to imply that such cameras that were deactivated and removed, played a role in this investigation update is showing. Maybe it meant more cameras along the waterfront would’ve been helpful. It’s really interesting how much the climate/world/technology/etc. all changed in the six years since the controversy (which might have been avoided in the first place if not for the unannounced installation). Now it seems there’s a camera on every porch anyway. The caveat in “we have your DNA” is that the police obviously don’t have a known sample to match the DNA to. All the recent arrests by using public DNA database searches, while amazing, have been of white suspects. The use of recreational DNA analysis is somewhat skewed to people who have incomes to blow $100 per person for giggles and grins. Those people then have to choose to make their data publicly accessible That alone tends to affect the demographics and breadth in the database. At this point, the fact that the police have “your” DNA is only marginally better than having “your” fingerprints without a positive match on hand. Eric1: The rates of consumer DNA (genealogy) testing has been doubling every year for a while now. About one in every 25 Americans now has access to information about their genealogy/personal genome. So while your first assumptions about the demographics of the perpetrator(s) in this case are perhaps not wrong, the chances of police finding a match are improving at a steady rate. I’d say there is also a good chance that someone who feels comfortable stabbing someone else in the neck on a public street full of people probably will commit other crimes that increase his chances of being implicated through further DNA evidence being left behind.As similar cold case breakthroughs have demonstrated in the last few years, warrants issued on DNA results for genetic relatives can lead back to a perpetrator. So your comparison to fingerprint evidence is a bit off the mark as my sibling’s fingerprints wouldn’t help the police one bit in solving a crime for which I was responsible, whereas now my 6th cousin’s online DNA profile might. The perp in this case may not take a home DNA test but maybe his uncle or grandmother will. There are also computer algorithms now powerful enough to identify individuals from anonymized DNA data in research studies. So DNA evidence can be a potent tool for law enforcement, in both zeroing in on suspects, as well as ruling out and exonerating innocent people accused of crimes. SPD identifying this suspect’s DNA is a very good thing. There is no statute of limitations on murder. I’m not sure about the laws but we do notice in court/police documents that sometimes DNA sampling is mentioned. Will research when I get a chance (I know some readers work or have worked in criminal justice/law so anyone beating me to it, TIA) …. Eric 1’s post made me curious. When is DNA collected from a suspect arrested for a crime for a criminal database? Is it routinely collected, like fingerprints? Or only when the person is suspected of certain types of crime? With a big caveat that I do not know the specific content of WAs laws, in general the Supreme Court has ruled that the government has to demonstrate a significant public safety interest in order to involuntarily collect bodily samples. For example, a person suspected of a DWI who refuses a blood test must be provided with a court order signed by a judge in order for them to have their blood drawn involuntarily. Being convicted of certain crimes makes you eligible to be required to submit to a DNA collection, but not all crimes. I don’t know what those crimes are in Washington. Personal experience: they took my DNA after I was charged with first felony. SPD rocks !!!! !Seattle is so fortunate to have a dynamite dept. Well, they have the DNA of somebody, but to say it’s THE suspects DNA or A suspect DNA doesn’t say much about resolving this crime unless they’ve actually found the person connected to the DNA they have. I’m a bit surprised there isn’t cell phone footage of this incident if there were that many people around at the time. There’s more security cameras to capture something along my street than what SPD shows in this video. Agreed. I’m not seeing the “breakthrough” either, as DNA is worthless without a comparison. I’m also curious about the huge amount of resources being thrown at this crime. Police would have had DNA at the time of the crime more than six months ago. Why the media blitz now? SPD, as well as witnesses, describe the victim as “out looking for trouble”. He got more than he bargained for. 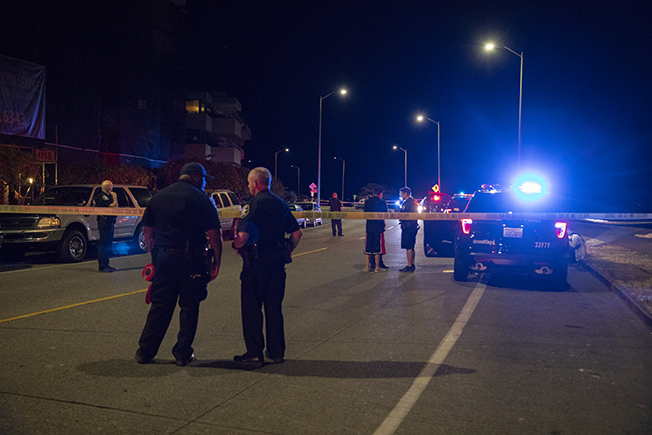 Not saying the killer shouldn’t be found and prosecuted, but I’d rather the resources went into the prevention and monitoring of what has become a dangerous environment at Alki. The CSI effect is alive and well it appears. It is not that common for police departments to get usable DNA from a crime scene, particularly one outdoors in a public place. It also takes many months at times to analyze that DNA to tell if it’s usable or even points at anyone other than the victim.